Hodges Photography / Lou Hodges, Jr.
1. Jon White/Ryan Stillman – This team remains #1 for the third straight week, mostly because of their first overall draft pick, Improbable, who had a workout on Monday at Santa Anita. They also have War of Will, who will run in this Saturday’s Grade 3 LeComte Stakes at Fair Grounds. 2. Mike “Saratoga Slim” Spector – Saratoga Slim sits second in the power rankings once again and will look to pad his lead in the standings if Tight Ten wins the LeComte. Currently, all of his horses are working out and pointing towards prep races. 3. Jared Welch – The defending champion is getting ready to have some action this week, with Gun It starting in an allowance event on Thursday at Fair Grounds. 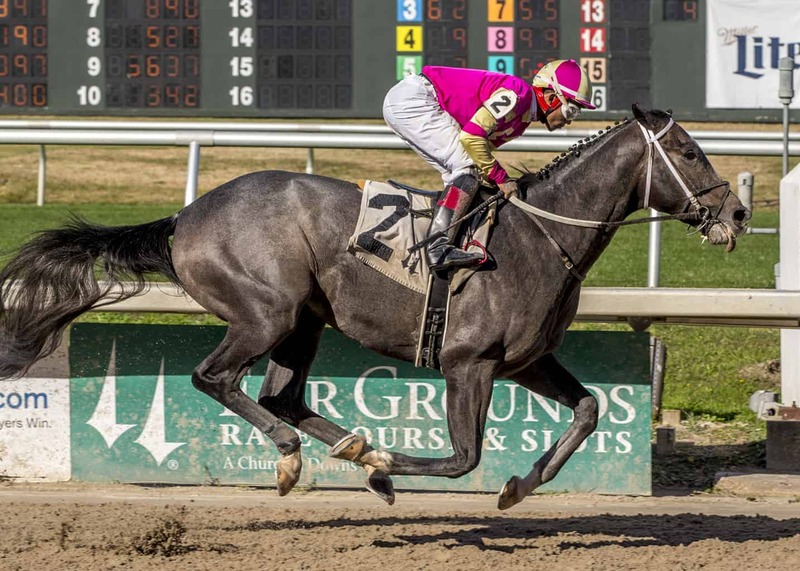 He will also hopefully have Gray Attempt running two weeks from now in the $150,000 Smarty Jones Stakes at Oaklawn Park, and Roadster is back on the track after a brief time away. 4. Aaron Halterman – We’ll see if his secret claim of Cornacchia proves wise when he runs against Gun It in a Fair Grounds allowance event on Thursday. He also could have three runners in the Smarty Jones, with Mucho Gusto, Long Range Toddy, and Bankit all possible for the race. 5. The Magic Mike Show – The Magic Mike Show made the only claim of the week, taking Walking Thunder and dropping Arcaro. They will pick up their first points of the season when Plus Que Parfait runs in the LeComte, and they will also be closely watching Award Winner this Friday at Gulfstream Park when he takes on allowance company. 6. Patrick “Mad Dog” Meagher – There is nothing new to report this weekend for Patrick, with none of his horses running. The team’s hopes rest on the shoulders of Code of Honor and Knicks Go, who must rebound from poor performances in their last starts. 7. Dan “Wise Dan” Waite – Wise Dan will have his first runner of 2019 when Bourbon War takes on Award Winner and seven others in an allowance race at Gulfstream Park. This could end up being a pivotal race for the colt to kick off his season. 8. Brandon “B$” Bauer – It will be a quiet week for Brandon, with none of his horses expected to run. The biggest hope for this team still probably rides with Coliseum, who needs to bounce back in his next race. 9. Paul “Free Beers” Withrow – Free Beers moves up this week for one simple reason: his big horse finally showed back up for a worked. That horse is Game Winner, who recored his first workout of the season at Santa Anita Park. However, he lost Cairo Cat to injury, which still has this team searching for healthy horses. 10. The Fans: Austin and Bones – They are back to last place after a total flop from their UAE Derby hopeful Royal Marine. Things can turn around quickly, though, as Big Scott Daddy, Mihos, and Vekoma have the potential to pick up points.